I was hired last week by a Washington D.C. resident who wants to get married in Birmingham on May 30, 2010. Like my wedding, this bride is hoping to create a personal wedding that gives off a relaxed and inviting atmosphere. She would like the ceremony and reception to be in the same venue and is thinking she will keep the guest list to a 100 of her closest family and friends. ....Where, Oh Where, will this wedding be??? The outdoor patio is a perfect area for a cocktail reception. If you are counting on this space for your guests, make sure you have a tent on hold in case of bad weather. You will also need to bring in your own chairs and tables. The sound stage is an additional area that can be used for a seated dinner or reception. The space is small and I wouldn't recommend using this alone unless you are having a very small wedding. If you are into the theater...this would be a fun rehearsal dinner venue!! Rent: $1450 for these two areas. Catering Requirements: You can use whatever caterer you would like and you can bring in your own bar. The Cantina is a great restaurant in the Pepper Place area. I have been hosting parties there for years so I stopped by to see how it would be for a wedding venue. The one downfall for this venue is the word "Cantina" on a wedding invitation. What do you think about calling it by its address instead of it's name?? The outside of the building has a good look to it and the name of the restaurant is not plastered across the front in a neon light like most Mexican restaurants I know. The patio is cozy and clean and it will definitely fit 100 chairs (rented chairs) for the ceremony. First view of the big room......it would be perfect for a reception or seated dinner. Second view.....the opening (where the man in all denim is) is another room that can be used for a party. Caterering: Cantina has a great catering menu for you to select from. You must purchase the alcohol through them. I had never been out to Mt. Laurel so I was excited to make the trip down Highway 280 (actually, I wasn't that excited about the 280 part, but excited to see the town that had gotten so much hype a few years ago). The Townhouse is a small two story building that is a tea room by day and an event venue by night. This is the front of the Townhouse. Everyone meet Darlene...lower left corner. She is the super sweet lady who runs the Townhouse. One of my favorite things about The Townhouse is that they can close the street off for your event at no additional charge. 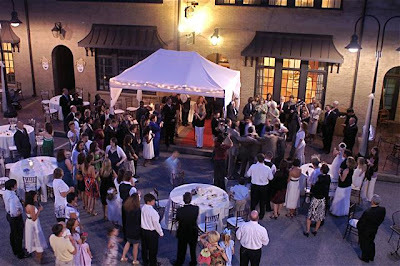 For this wedding, I would want to tent the street and let the reception flow from the street into the main floor of the Townhouse. This is the main floor of The Townhouse. It is a small room that would be a good location for a few tables and the food. This room, as well as the street, is ipod adaptable in case you didn't want to hire a band. The upstairs of the Townhouse is more like an upstairs apartment. There is a small kitchen, living room, den and billiards room. It is open for events, but I am not sure it would be a good fit for this wedding. 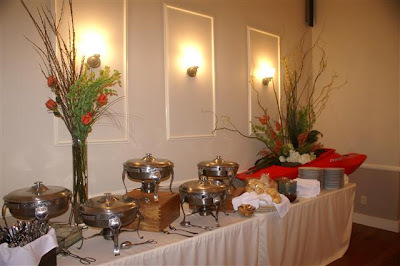 Catering: You can either use their catering or get drop off from another caterer. You MUST bring your own alcohol. They do not have a liquor license. I hope you enjoyed you tour of the "off the beaten path" venues I visited this past weekend. Keep them in mind for your upcoming events! !